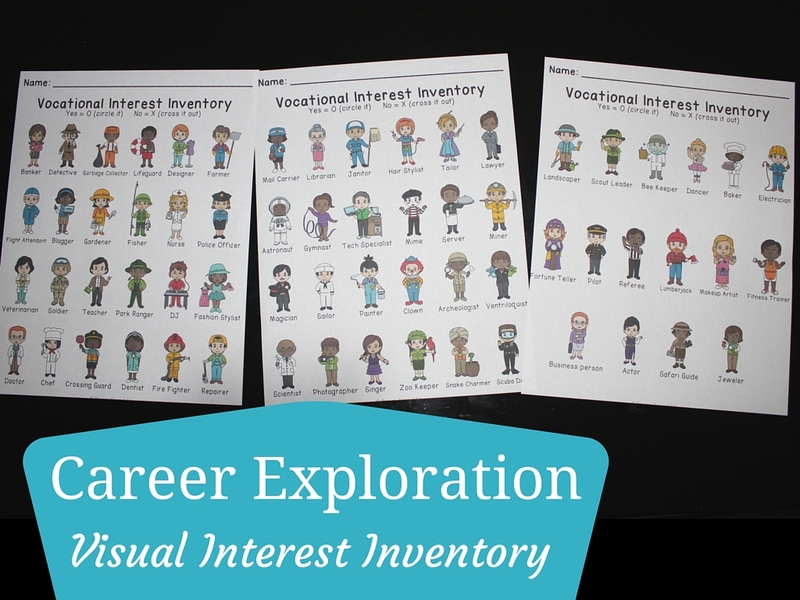 Career Exploration: Vocational Daily Questions, Job Posters, Interest Inventories and more! 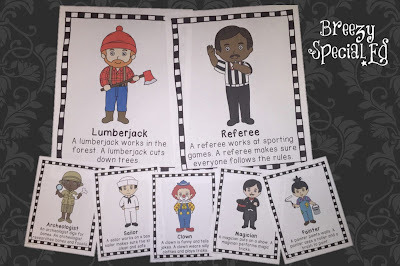 As a life skill teacher, one of our responsibilities is to expose our students to different jobs and try to help them figure out what they are interested in doing after they complete school. 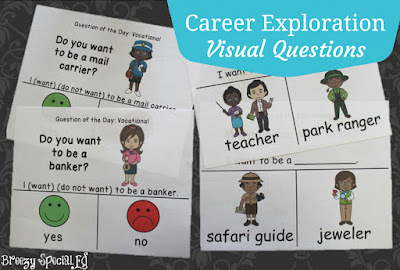 Career exploration is especially important in secondary education, but is an important part (and becoming mandatory in some states) of elementary life skills too! 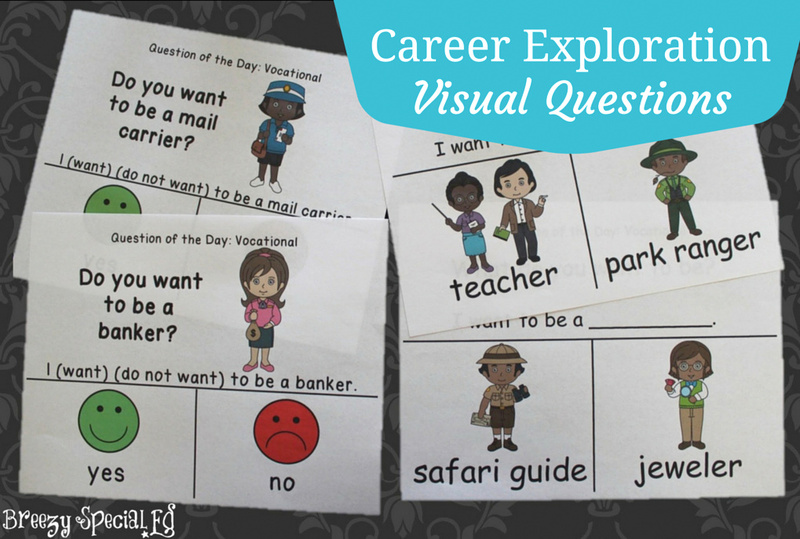 These fun job posters and daily questions will help you do just that! Posters or Cards: Each job (there are 64 of them in this packet) is described on a poster with a simple two sentence description. 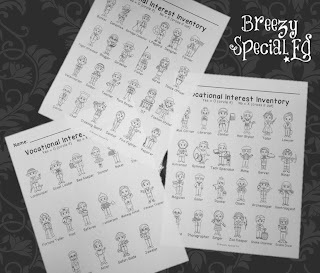 These can be printed full size, two to a page, or even 4 to a page. I showed some of the full page and four-to-a-page printed above. 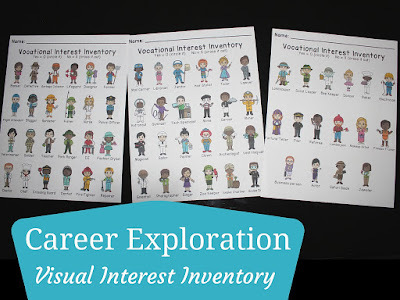 I think it would be so cool to have the full size posters in the classroom, and the smaller sized cards given to students when they say they are interested in that job. I also like the card size option, as these would be great to print and put on a ring so you can use if you are giving this vocational assessment one-on-one with a student. Errorless Questions: Many students with special needs are concerned with answering questions correctly. These daily questions are designed for students to get exposure to a wide range of jobs/vocations, to start thinking about what they might be interested in, and to practice answering questions errorlessly. Two different types of questions are available, allowing you to choose what will work best for your students. What do you want to be? Given 2 picture choices. These are all opinion questions and students should learn that it is okay if their answer is different than their classmates’ answers. We graph our answers (by putting pictures underneath) so we can compare and see our similarities and differences. Gender neutral terms are used, but the picture may be of either a male or a female. Explain to students that just because a girl (or boy) is pictured, doesn’t mean it’s a girl (or boy) job, and anyone can do it! Since there are only two choices, some students might (rightfully) say that they don’t want to do either. I would respond, that’s okay, you don’t have to, but if you had to choose which one would it be? Do you want to be a ____? Yes/No questions. For many students, answering Yes/No questions can be difficult. Many students are conditioned to always say “yes” (or “no”). It is important for these opinion question, that staff responds positively to all choices as not to make a student think they answered incorrectly. Journaling: Various journals are also available to help students record their responses. Journal levels include drawing, writing a word, writing a sentence, or writing a sentence and including why. This is great for work at the beginning of class or to keep those students who finish everything quickly busy! Also is great for students to compile their answers and include in an assessment to present at an IEP meeting. 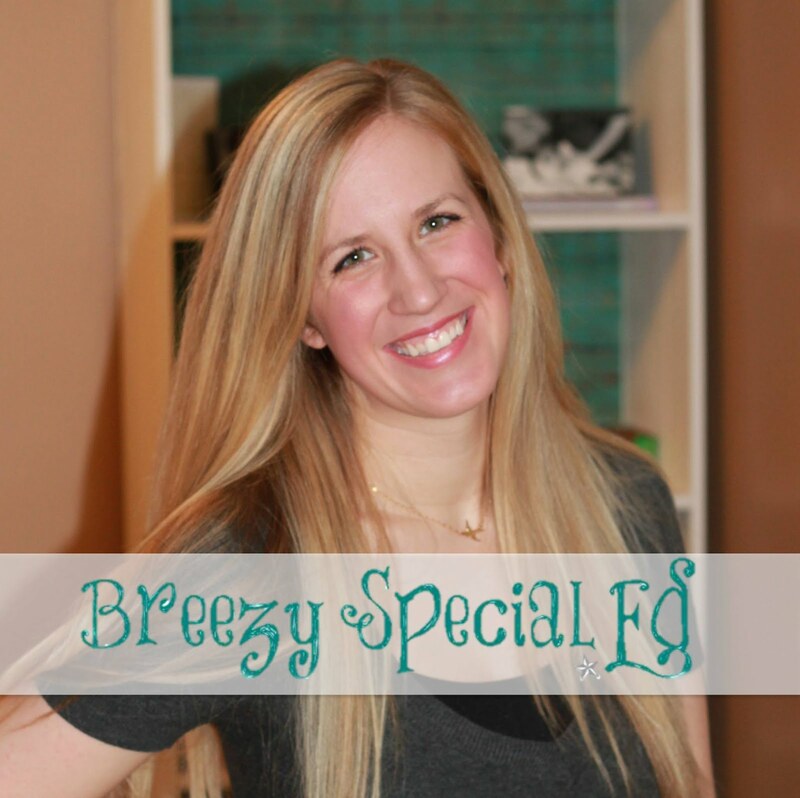 There are so many things you can do with this product! Chris chimed in on Facebook saying, "I use the vocational question of the day as part of my morning work. We have already discussed careers. It exposes them to ones they haven't even thought about. It's great!" Welcome to Spedland commented on TpT and said, "This pack is great! My high school severe-profound students love sharing why they would or would not like a job, and my nonverbal students are able to communicate their opinions too! Thank you!" 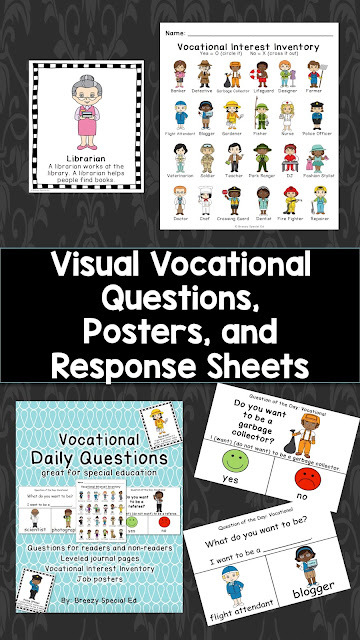 Grab this pack of Vocational Questions and Resources in my TpT store! Can I just become your best friend. I love all of your ideas. How do you have time for everything in your schedule? Both at school and completing new actives at home. :) Thank you! Before I had my son, TpT and creating product was my hobby. So while my husband watched TV all night, I would create products! Now that I have my son and I'm staying home with him, I try to squeeze some work in during naps and when he is asleep for the night! Question can you post what your daily/weekly schedule looks like. I am always trying to make things in my class run smoothly while getting everything in my students need to learn. It's tricky because my class is different than most special education classrooms in that we have our student rotate between 3 teachers. We keep our students for math and language arts, and then mix up the students for their electives, such as art/social studies/science/PE/daily living, etc. You can read more about it in the "about me" section on my blog and some of the posts written during the summer of 2015 (look in the achieve section on the right side bar) might be helpful at least for seeing the LA/math portion!